This recipe has been a really long time coming on this blog. 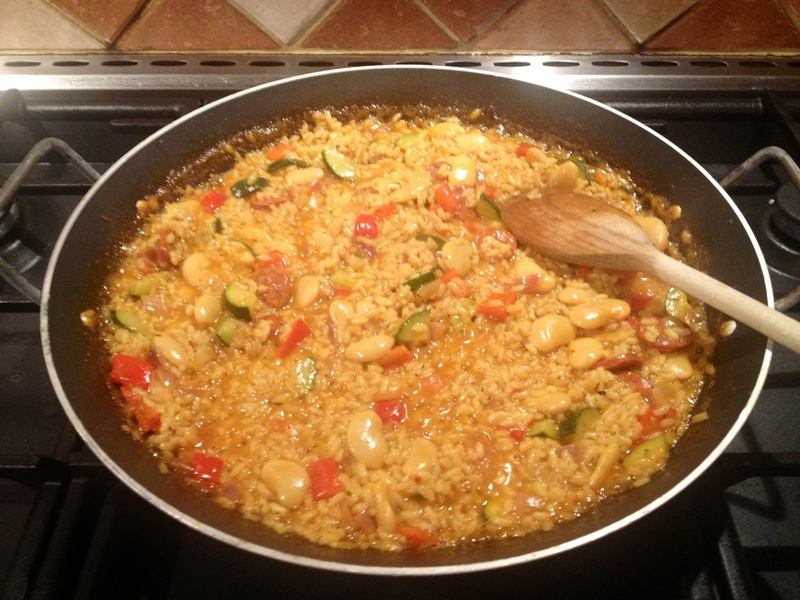 It’s something my Mum has made for as long as I can remember and is regularly whipped out at family parties and barbecues, so much so that several of my friends have been known to refer to it as Mama Huntley’s Famous Paella. It’s one of my favourite meals, so much so that I have taken it over and adopted it as my own, adding my own little twists to it. I’ve had loads of requests for this one so here it finally is! One of the great things about this dish is that you can really mix and match the ingredients depending on the occasion or simply what you fancy. 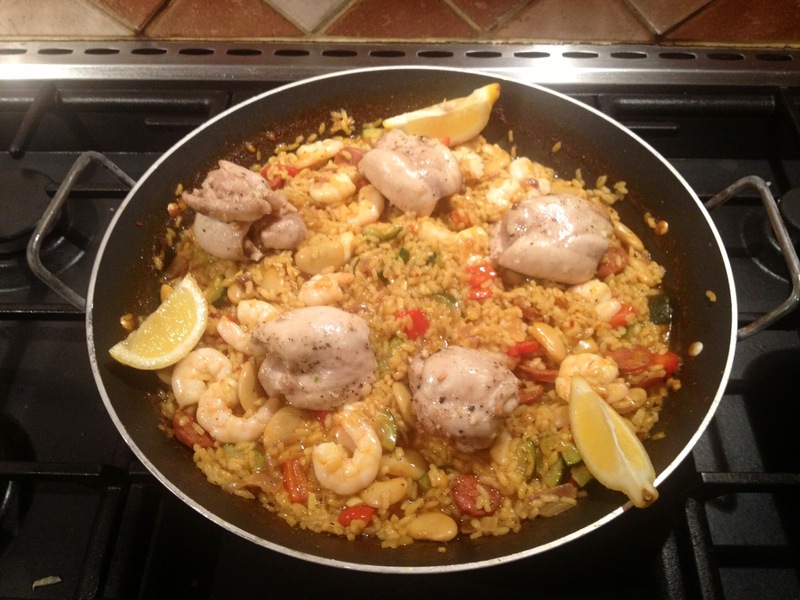 Don’t have the prawns if you don’t want them or I used boneless chicken thighs here, but you could use any other cut, you could even use the leftovers from a roast and stir it through the dish to reheat. 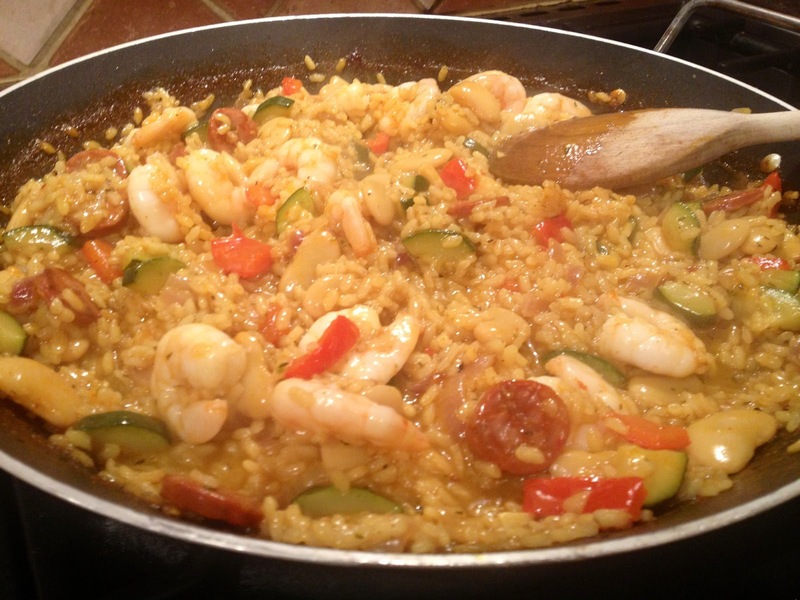 If you cut out the meat you could make it a seafood paella using the prawns and adding some white fish and mussels. The possibilities are endless. 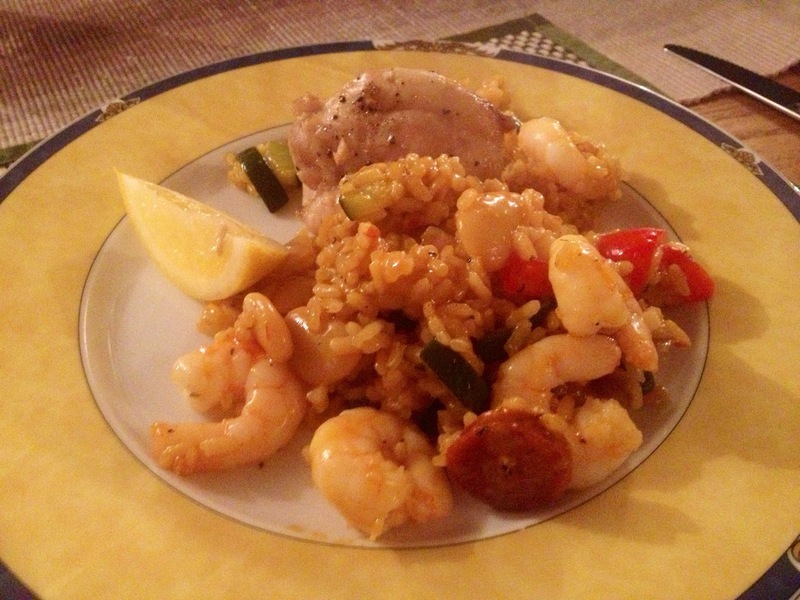 You can even go veggie cutting out the chorizo, prawns and chicken completely. I find the veggie version makes a really great side dish at summer barbecues. This recipe will serve four, but I always like to make extra so I can have the leftovers for lunch! 1. Preheat the oven to around 200°C. 2. 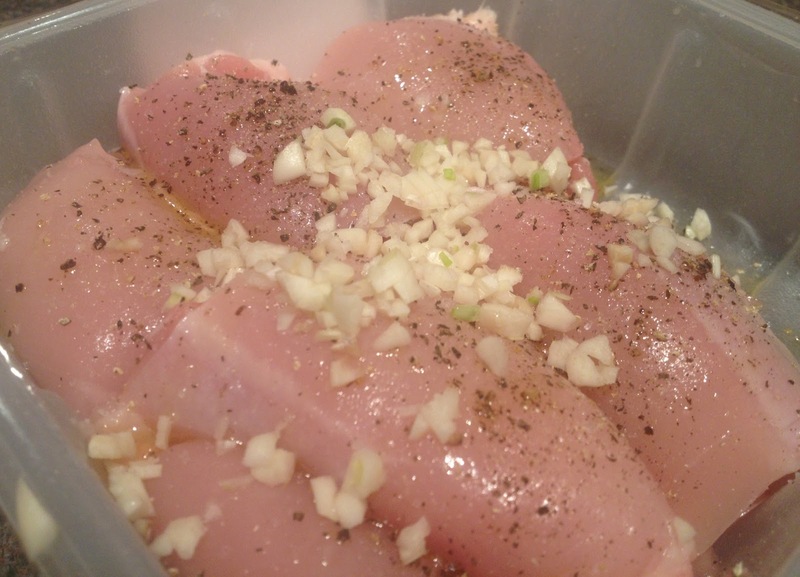 Use half of the garlic to marinate your chicken. Rub into the meat with a generous glug of oil and season generously with salt and pepper. Ensure each piece is evenly covered. You can leave this to marinate for a few hours or even over night if you wish but its fine just to cook this straight away. 3. Place in a roasting tin and roast in the oven for 20-25 minutes whilst you’re getting on with the rest of the dish. VERY IMPORTANT NOTE: If you’ve used a different cut of chicken eg. breast, legs or wings, please follow the guidelines on the packet as to how long you should roast for. The thighs I used were boneless and quite tiny so therefore didn’t take very long so I don’t want you to follow my timings if you’re roasting a couple of big legs as they will be undercooked and undercooked chicken will make you ill. Whichever cut you use please check the packet for cooking timings. 4. 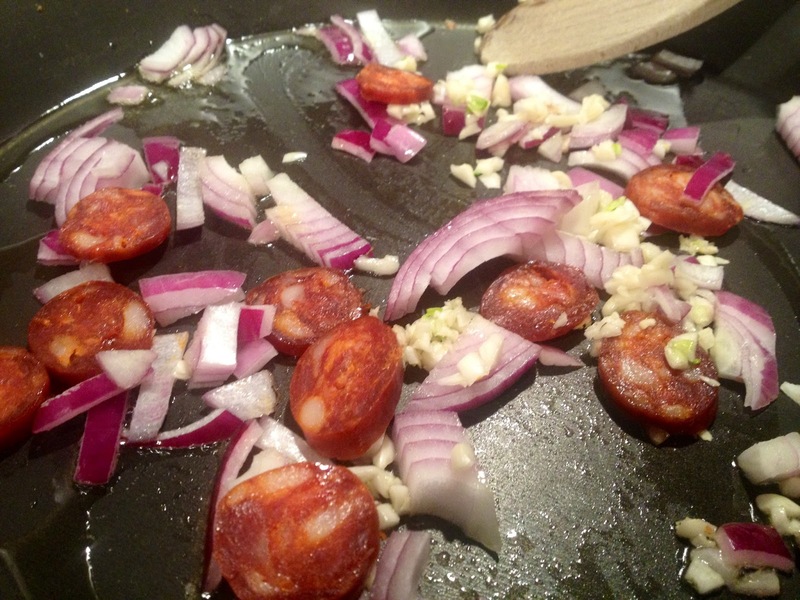 In your paella dish (or large frying pan) heat some oil and begin to fry the chorizo, onions and the rest of the garlic until onions are softened. 5. 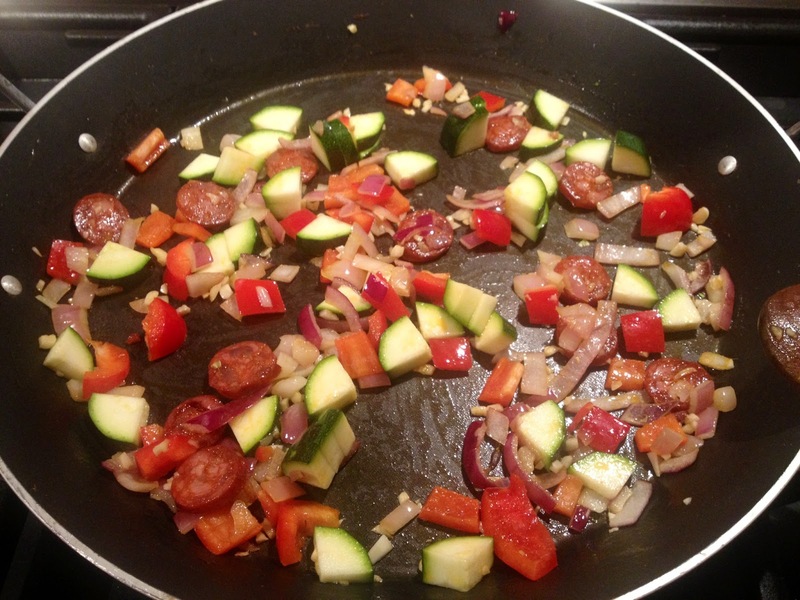 Add the courgette and pepper and fry for a couple of minutes until the vegetables begin to soften. 6. Pour the rice into the dry pan. 7. 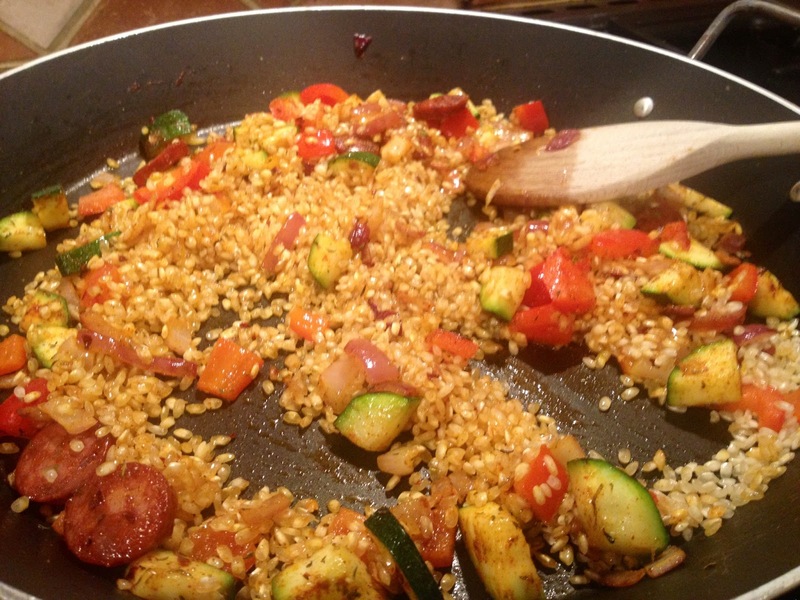 Give the dish a good stir to ensure the rice gets completely coated with all the juices from the pan. 8. 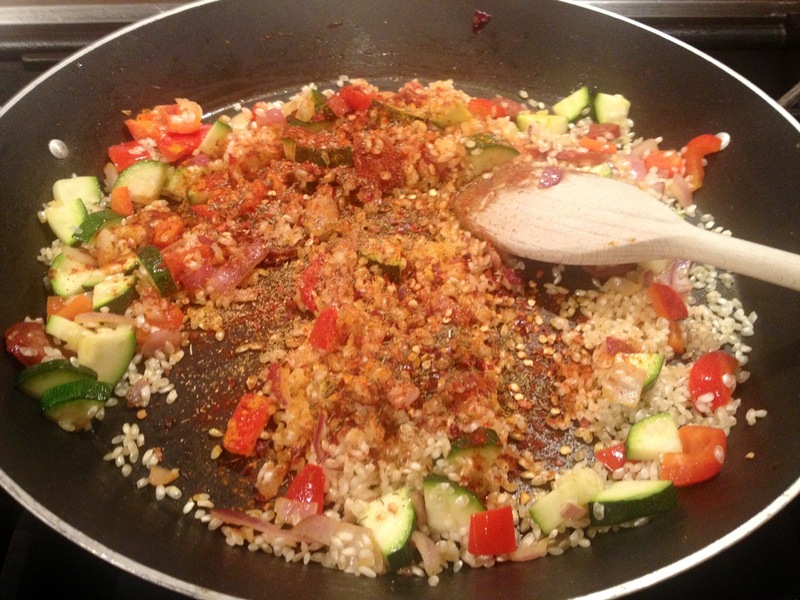 Add all of the spices and stir well to coat the rice. 9. 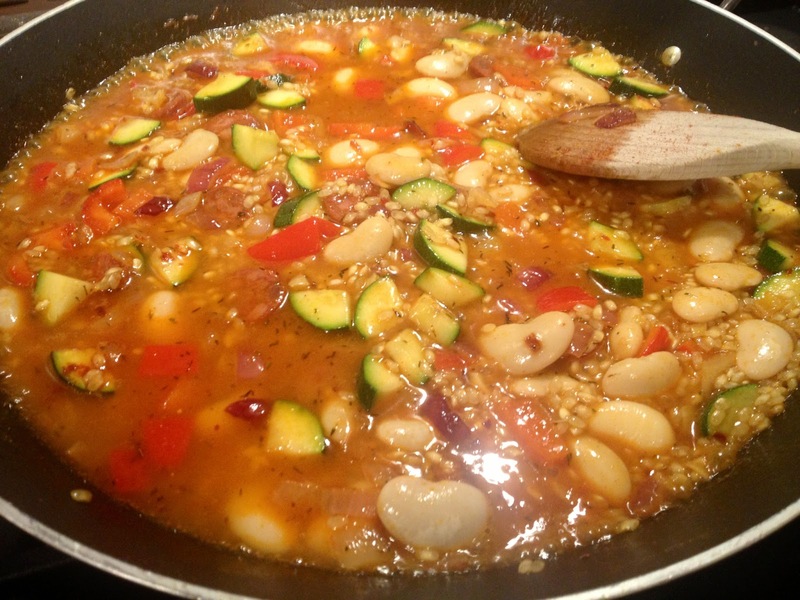 Add the butter beans, including the juices from the can. Stir until the rice has soaked up most of the liquid. 10. Begin to add the vegetable stock a little at a time. 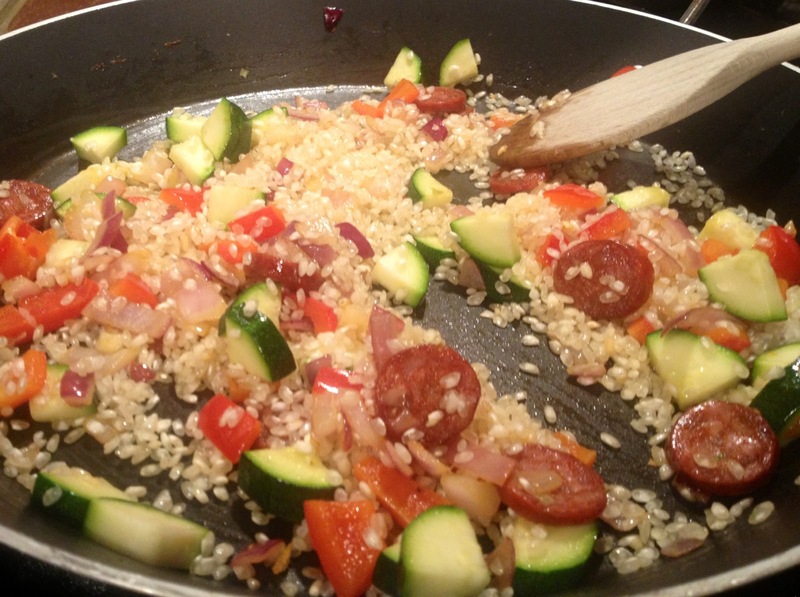 Allow the rice to soak up the juices and then add a little more. Stir throughout to make sure the rice doesn’t stick. Continue until the rice is cooked. 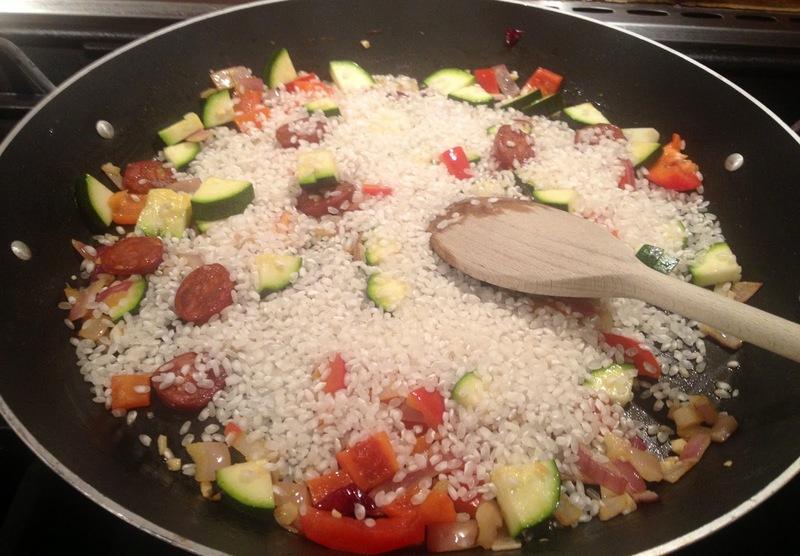 You might not need all of the stock, just continue to add a little at a time until the rice is done. If you use up the stock and the rice is not cooked you need more liquid so just use water. This process should take around 15-20 minutes. 11. When the rice is cooked and the liquid almost gone season well with salt and pepper and the juice from half of the lemon. 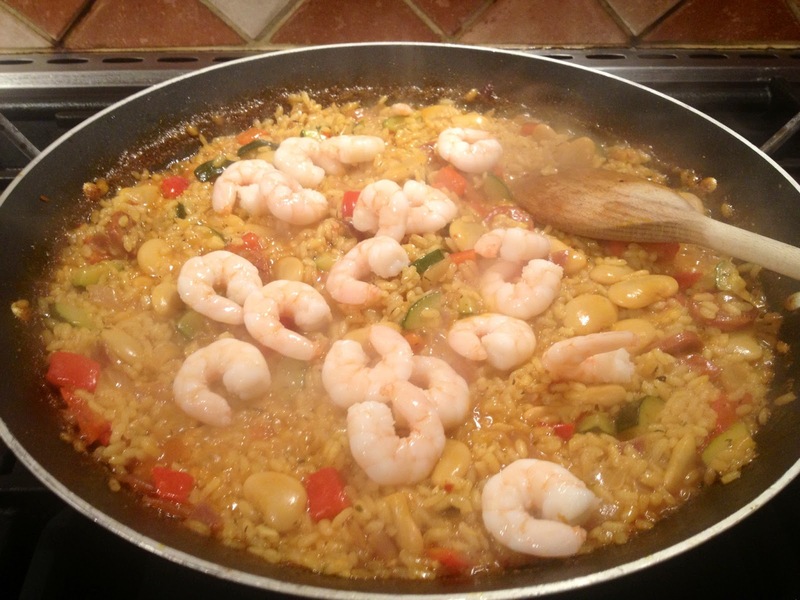 Then add the prawns, as these are already cooked they just need heating through, so stir into the dish allowing the heat from the rest of the ingredients to warm them. 12. By now your chicken should be cooked. 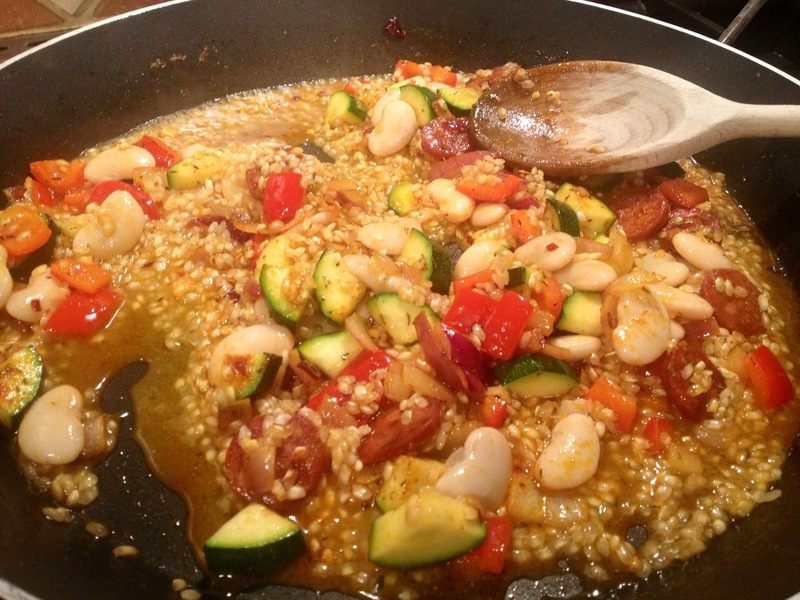 Place on top of your paella and garnish with slices of the remaining half of the lemon and you are ready to serve. I like to take it to the table in the dish and serve at the table as it makes a great centre piece and everyone can dip in and help themselves to seconds.